MainAll NewsMiddle EastWarplanes in Cyprus Preparing for Syria Strike? Warplanes in Cyprus Preparing for Syria Strike? British airplanes and military transporters have begun arriving at an airbase in Cyprus, according to a report by the Guardian. In what might indicate that the British army is preparing for an attack on Syria, the Guardian reported on Monday that warplanes and military transporters have begun arriving at Britain's Akrotiri airbase on Cyprus, less than 100 miles from the Syrian coast. Two commercial pilots who regularly fly from Larnaca told the Guardian that they had seen C-130 transport planes from their cockpit windows as well as small formations of fighter jets on their radar screens, which they believe had flown from Europe. Residents near the British airfield, a sovereign base since 1960, also told the newspaper that activity there has been much higher than normal over the past 48 hours. If an order to attack targets in Syria is given, Cyprus is likely to be a hub of the air campaign. The arrival of warplanes suggests that advanced readiness – at the very least – has been ordered by Whitehall as Prime Minister David Cameron, U.S. President Barack Obama and European leaders step up their rhetoric against Syrian leader Bashar Al-Assad, whose armed forces they accuse of carrying out the chemical weapons attack last Wednesday that killed many hundreds in eastern Damascus. According to the Guardian, the U.S., Britain and their allies are likely to wait until a UN team currently in Syria has compiled its report and left the country, before carrying out any air strikes against the government. If the strikes go ahead, they are expected to focus on the strongest sinews of the Assad regime's power. Hitting stockpiles of chemical weapons could appear more proportionate but that would bring with it the risk of dispersing neurotoxins over a wide area, potentially causing even more harm than Wednesday's gas attack, the newspaper noted. 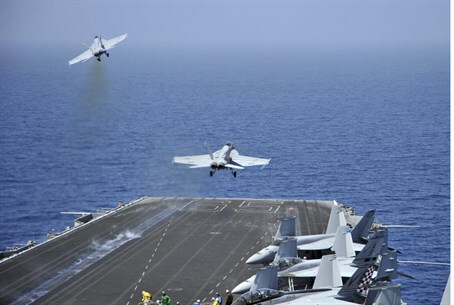 The latest report follows a report in the Telegraph, which said that British and American naval vessels are currently preparing for military action against Assad’s regime. According to that report, military commanders are currently drawing up a list of potential targets to strike, in a operation that would resemble the opening phase of the western intervention in Libya which helped oust Muammar Qaddafi. British Foreign Secretary William Hague and Turkish Foreign Minister Ahmet Davutoglu upped the ante on Monday by claiming United Nations approval was not necessarily needed for intervention to take place. "Is it possible to act on chemical weapons, is it possible to respond to chemical weapons without complete unity on the UN Security Council?" Hague asked, rhetorically. "I would argue, yes it is. Otherwise, of course, it might be impossible to respond to such outrages, such crimes and I don’t think that is an acceptable situation." Assad has threatened that any western intervention would end in failure. “The United States faces failure (if it attacks Syria), just like in all the previous wars they waged, starting with Vietnam and up to our days,” he said.